Welcome to my (hopefully much anticipated) Fjallraven Kanken backpack review! 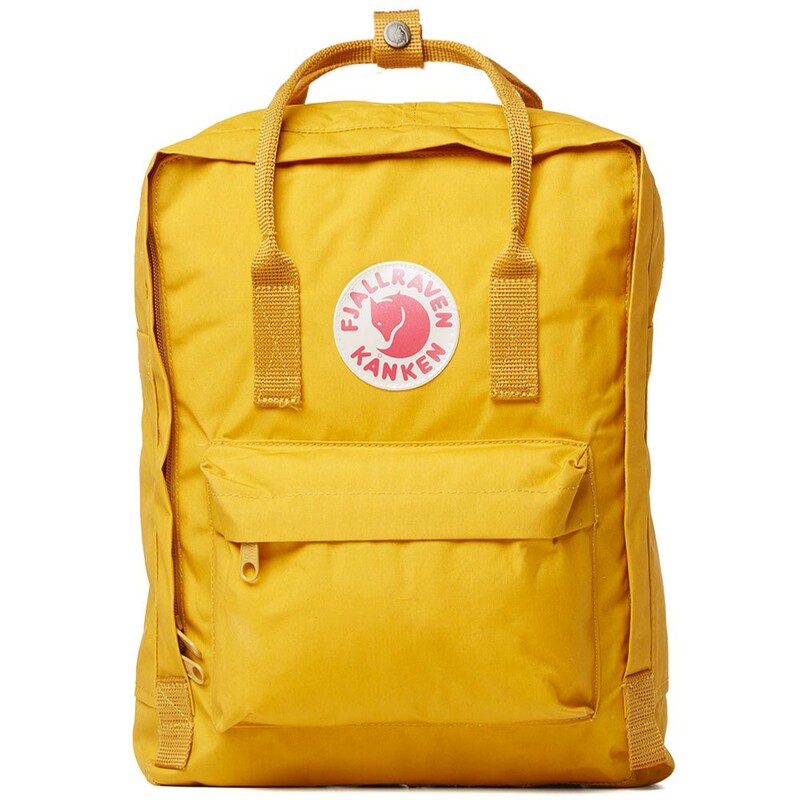 If you’re already familiar with the Fjallraven brand and the [easyazon_link identifier="B007AGQF7E" locale="US" tag="swedishbackpack-20"]Kanken backpack in particular, you may want to skip ahead to the actual review portion of this post. If you’d like to learn a little more about the company and the bag’s history, sit back and read on :-). If you couldn’t tell from the website, we really like Fjallraven products. 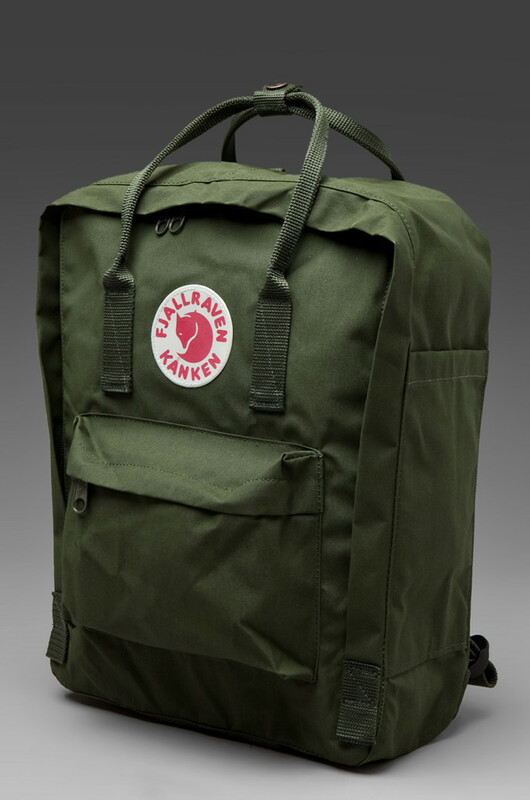 And like many people, the first Fjallraven that we both fell in love with was the Kanken. I mean how can you not? There’s a reason that the Fjallraven Kanken is currently one of the most in-demand and trendy backpacks anywhere. Between the durable Vinylon F material, the handcrafted quality, and the countless color options to choose from, it’s easy to see why the Kanken has seen such a surge in popularity over the past few years. But the Kanken isn’t just some hot new product. In fact, its history stretches back nearly four decades, to the late 1970’s in Sweden. That was when Fjallraven, a growing Swedish backpack manufacturer, decided to help solve the back pain epidemic that was plaguing the country. Under the lead of Fjallraven founder Åke Nordin, the company developed the Kanken with the hopes of helping schoolchildren more evenly distribute the weight of their books and supplies – a likely cause of lifelong back problems during such a crucial period of growth. Although it was originally designed for children, it wasn’t very long before adults all over Sweden began searching out the Fjallraven Kanken bag for their own personal use. And just like that, the Kanken established itself as one of the most popular Swedish backpacks of all time. Fast forward a couple of (dozen) years, and the iconic Fjallraven Kanken’s popularity has spread all throughout Europe and to North America. Today, you can’t walk through a college campus or ride a subway car in an upscale neighborhood without spotting a Kanken somewhere. And I promise you, once you get your first Kanken and experience the high quality, stylish design for yourself, you’ll understand why they’re flying off store shelves in boutiques everywhere. If you’ve read the whole post so far, thank you! Here’s the Kanken backpack review you’ve been waiting for. For those of you who skipped ahead, now is the time to stop because it’s about to get real interesting! The Fjallraven Kanken is made out of the extremely durable Vinylon F material which is not only resistant to rips and tears, but is also waterproof – an important quality to have no matter whether you’re in the city or out enjoying nature. While the Kanken backpack isn’t very likely to tear, it can be susceptible to scuffs from everyday use – especially if you’re carrying it with you on busy public transit. For some Kanken owners (like me), however, this adds character to the bag and gives it a more worn-in, vintage look over time. It’s definitely worth noting that lighter colors are much more likely to show their scuff marks than darker shades. If you read the top part of this Kanken backpack review, you’d already know that Fjallraven originally designed the bag to be a comfortable alternative to the other options that were on the market at the time. That experiment was a huge success, by the way. And since the Kanken has been largely unchanged since its first appearance in 1978, it’s no surprise that it’s still one of the most comfortable stylish backpacks today. While they may not look like much at first, the thin nylon straps are surprisingly comfortable for carrying normal weights, such as what you would around the city, at school, or for a casual day hike. There’s a built-in foam insert in the back of the Kanken rucksack which helps further cushion your back during periods of extended wear. As comfortable as it is however, I probably wouldn’t try to take it with me for a multi-day outdoor adventure. As an added bonus, the Fjallraven Kanken can also be carried in your hand or on your arm thanks to the smaller top strap which is equally as comfortable as the two on the back. The iconic beauty of the Fjallraven backpack is in its basic style. The bag comes in more than three dozen different colors, with some of the most popular being ‘sky blue’, ‘frost green’, and ‘ox red’. 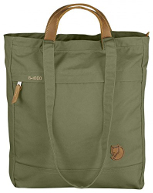 Regardless of color, the front of the bag is adorned with the attractive (and reflective) Fjallraven Kanken logo. The Kanken comes with one large central compartment, a small front pocket, and two small side pockets. The main compartment is large enough to hold a 13” laptop, while still leaving plenty of space for the rest of your everyday items such as a wallet, makeup bag, scarf, notebook, etc. The front pocket is great for any small item you want convenient access to, and the side pockets are ideal for holding an iPod or an umbrella. They aren’t, however, large enough for most water bottles, although I’ve always had enough room inside of the bag to carry mine. 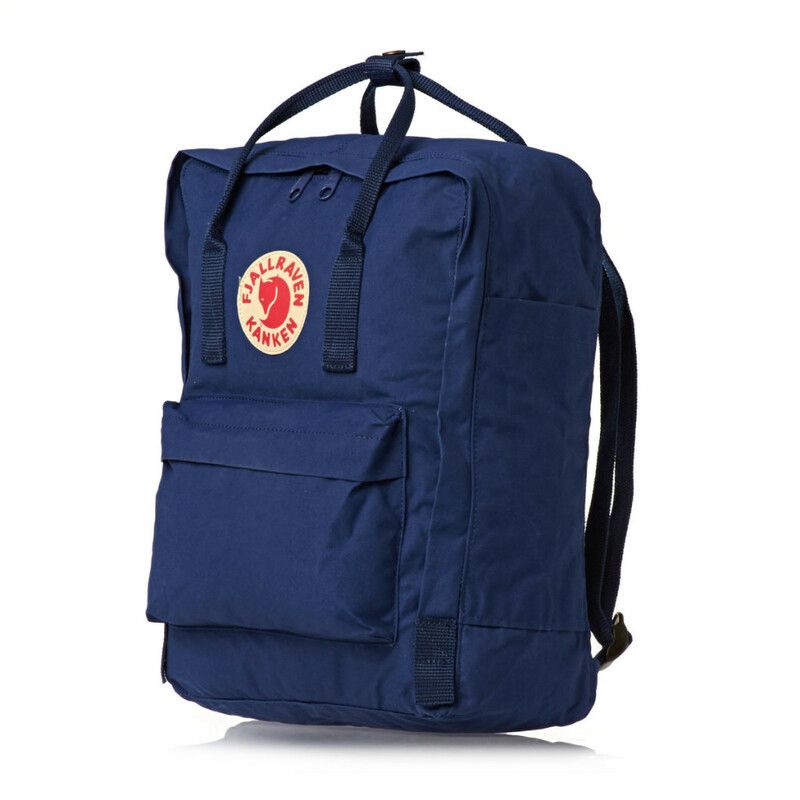 For anyone who needs to carry a laptop larger than 13” with them on a regular basis, Fjallraven does make a Kanken laptop backpack in both 15” and 17” sizes. You probably knew this going into this post, but I’m already a big fan of everything Fjallraven, and the Kanken backpack is no exception. No matter what your intended use, there’s a pretty good chance that you’ll fall in love with the Fjallraven Kanken just as much as I have. It’s durable and waterproof, has plenty of interior storage space despite its compact appearance, and is currently (and for good reason) one of the hottest bags on the market. I’m going to wrap this Kanken backpack review up by giving the bag a full five stars out of five – and I’m not the only one. There are plenty of other Fjallraven Kanken backpack enthusiasts who also feel like the Kanken is the best backpack out there.